Where to drink/buy cider in Copenhagen? My last time in Copenhagen was almost three years ago and from what I remember, there was not much real cider around the city except the alco-pop produced by the Carlsberg Group. Now, three years later, cider significantly gained in popularity and is offered by many restaurants and bars. More to that, some restaurants list cider in the wine menu, not in the beer menu as almost the rest of the world does. 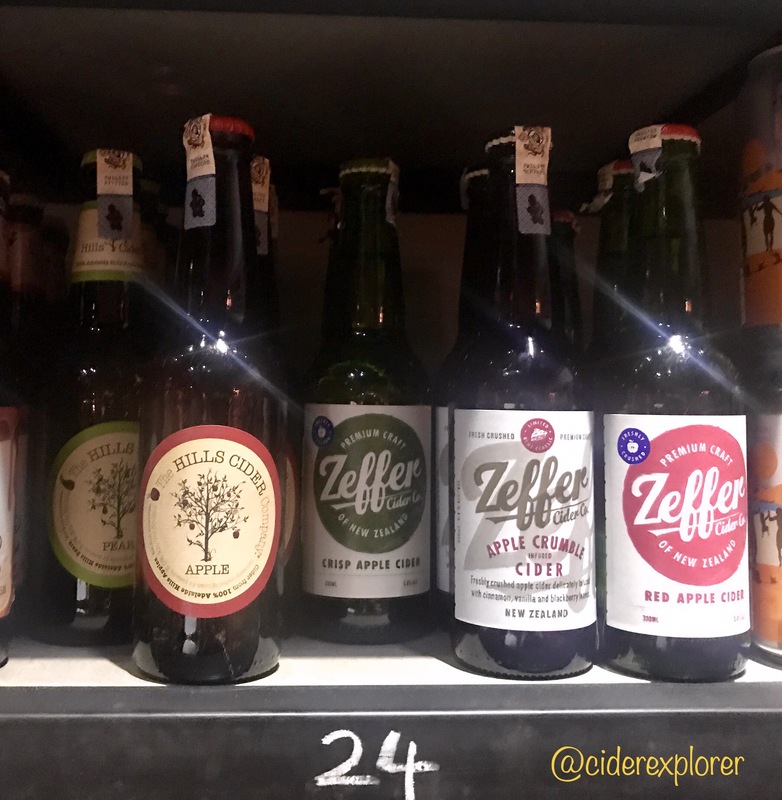 So where you can find real cider in Copenhagen? Scroll down to see my recommendations. Holm Cider is the absolute #1 in Copenhagen in terms of cider. Conveniently located in a very popular and apparently the coolest neighbourhood of Copenhagen, Vesterbro just behind the Copenhagen Central station and Tivoli Gardens with countless bars and restaurants. Holm Cider is a place that has a great atmosphere and offers a wide selection of cider on draught, by the glass or bottle to drink there or bring home. They will even make you a cocktail based on cider. 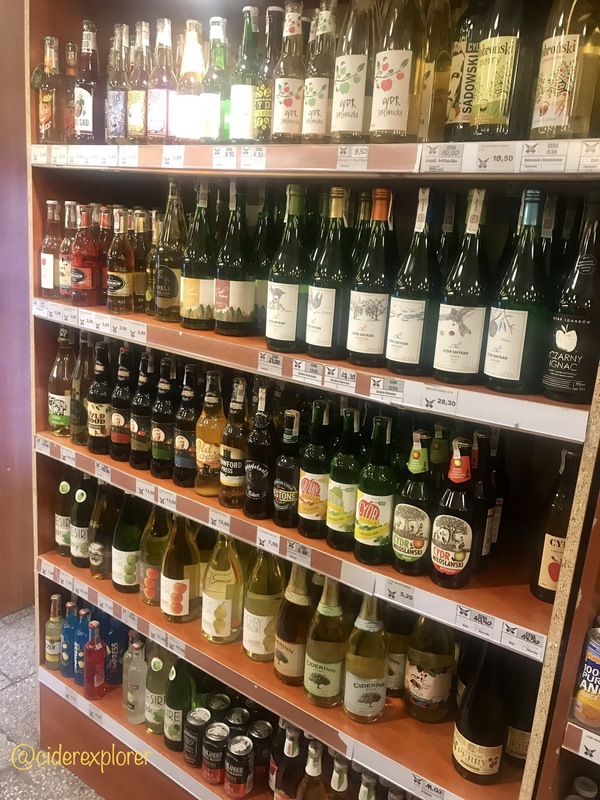 If you are new to cider and don’t know exactly what you’d like to have a very friendly and knowledgable staff will assist you with your choice. Sometimes Danish cider makers stand behind the bar. Hence, Holm Cider is a true cider gem in this part of Europe. As for cider producers, you will find mainly cider from local Danish producers such as Aeblerov, Ciderrevolution, Decideret Cider or Mergelsø. But also cider from many European cider makers such as Dunkertons, Burrow Hill, Manoir du Grandouet, Andreas Schneider or Cidrerie du Leguer just to name a few. Holm Cider has also an outdoor seating area so when the sun comes out you can sit outside with a glass of cider and get a feeling of Danish hygge. Actually, I remember Holm Cider already from my last visit to Copenhagen. At the time Holm Cider was just a cider shop located on the other side of the street with very strange working hours. Since I was also on a business trip last time, I didn’t manage to get inside and speak to the owner. I was just looking through the window at cider bottles of producer I have never tried before. Finally, I had a chance! And, it was fantastic! I haven’t been there in person but Florian Profitlich from Gutshof Kraatz warmly recommended this place to me. The bar is open only from Wednesday until Saturday and if you fancy a bottle of local cider to take home with you, you can visit their shop just a block away. Lord Nelson Bar is a tiny bar in the city centre that doesn’t make a good impression when you walk in as it’s dark and smells of cigarette smoke although no one actually smokes there. Nevertheless, it’s worth a visit as the owners make their own cider from apples grown in an orchard close to Skælskør. They make a few different English style ciders from whole juice usually by blending two to four apple varieties. I’ve tried their Danish Misstress and really enjoyed it. Usually, they have two different ciders on tap that have various level of sweetness/dryness. For their current offer click the link. Taphouse is also located in the centre of Copenhagen so if you are doing sightseeing here you might sooner or later pass by this bar. Taphouse is a craft beer bar that has astonishing 61 taps and two of them are dedicated to cider or perry. At the time of my visit, they had perry from Hecks’s Cider and cider from Sheppy’s but they have also local cider from time to time. Check their website for the current tap list here and look at Tap 7 & 8 for cider/perry. Fermentoren is another place in Vesterbro offering cider. And, another spot that I really like in Copenhagen. I feel in Fermentoren like a student again meeting up with friends and having a good time. They have also an outdoor seating area which is great both when it’s hot and cold as blankets are available. Some places have just good vibes. Their current tap list can be found here. Cider/Perry offered on tap 2. I think Charlie’s Bar should actually be renamed to Little Britain as it is a true British gem hidden in Copenhagen. The moment you walk inside you feel that you are in an actual pub in the UK. Not only because everyone speaks English here. Just look at the picture below and tell me if I’m wrong. Cider wise they have only The Westons Old Rosie and an alcopop from Mortimer’s on draught. But due to reasons named earlier, it’s really worth visiting. Mikkeller is a famous Danish craft beer producer that has set up craft beers bars offering his beer all around the world. Can’t speak for other branches, but Mikkeller Bar in Vesterbro and Mikkeller Bar in Terminal 2 at Copenhagen Airport offer cider from time to time. Although admittedly, this cider is usually hopped. I loved the fact that Mikkeller also has a bar at the Copenhagen airport as I could say goodbye to Copenhagen by drinking Aeblerov+Mikkeler’s’ Citra Dry Hopped Cider. Check here for current tap list in Mikkeller Bar in Vesterbro and here for CPH Aiport. Yes, it is another place in Vesterbro. Kødbyens Fiskebar is a fish and seafood restaurant located in old industrial premises in the Meatpacking District (Kødbyen). I had a delicious set of oysters as starter and fish & chips as main here. Cider is listed in the wine menu and available only by the bottle either from Aeblerov or Ciderrevolution. Apart from earlier mentioned Holm Cider, you will find also at Rødder & Vin an interesting selection of Scandinavian cider from Fruktstereo, Gustav’s Cider and Nagelsbjerg available by the bottle. This is the place to go in Vesterbro if you’re looking for Asturian sidra from El Gaitero. If there are more cider spots in Copenhagen worth mentioning, just drop me a line! I would be happy to update my post. Where to drink/buy cider in Kuala Lumpur? 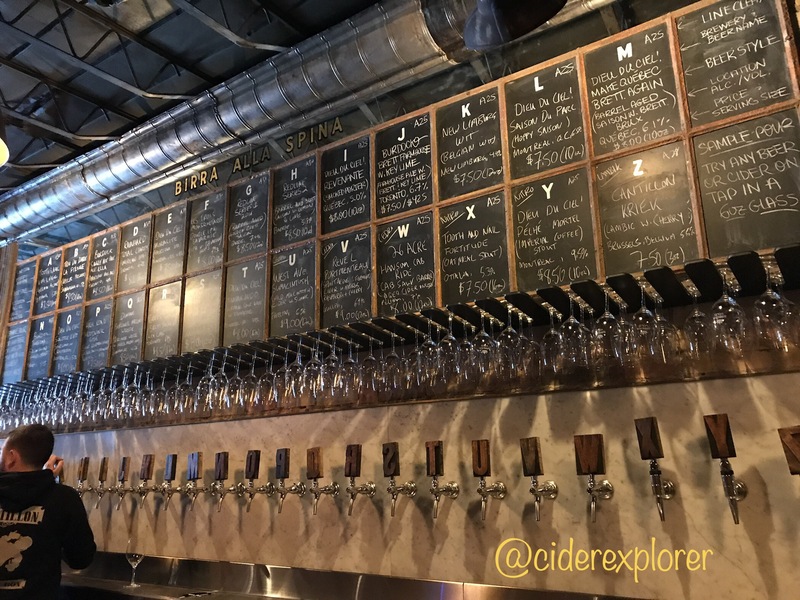 As you might have noticed, I travel quite frequently for work, so I always try to take advantage of it by compiling information about cider and its availability in the currently visited city. 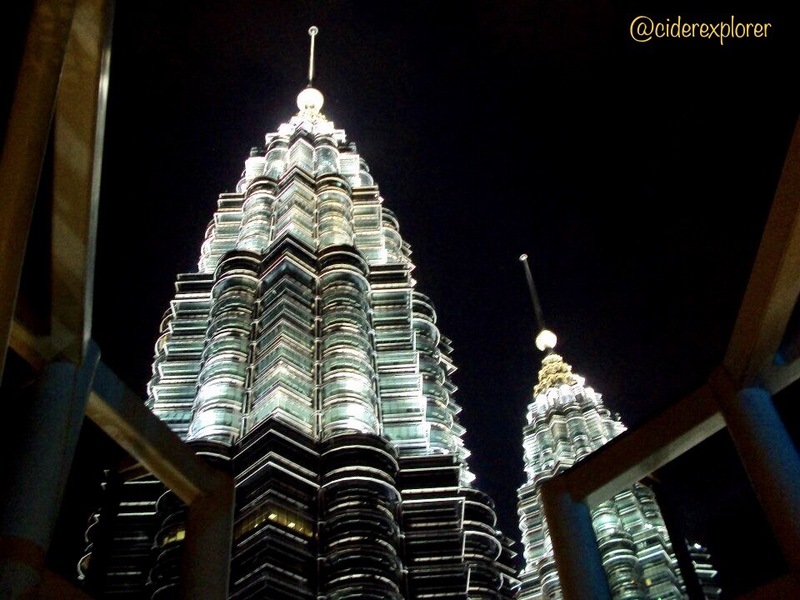 This time I had to head to Kuala Lumpur, the capital of Malaysia, which gave me the opportunity to explore local cider spots and sample a couple of not exactly local ciders. Malaysia is a Muslim country and for this reason, there is a high excise tax on beverages containing alcohol, cider including. Hence, cider is considered a premium product here. Most locals don’t consume alcohol, not only because of religious or financial reasons but because they prefer spending their pay on family-related activities. But, since Kuala Lumpur is a huge city with many expats living here coming from the UK, Australia, the Netherlands, Germany and many other countries, who earn incomparably more than Malaysians and have no better things to do than hanging out after work, the demand for alcohol-containing products is high. The demand might be high, but the vast majority of grocery stores stock Strongbow, Somersby or quite recently launched Apple Fox from Heineken (I reviewed the Dutch version of this cider here). Sometimes you can find other commercial ciders from the UK such as Magner’s, Gaymer’s, Savannah Dry from South Africa or Three Oaks Cider from Australia. If you want real stuff you should check stores and bars offering craft beer. This is what I did and here is the feedback from my KL cider tour. Ales & Lagers, located in a shopping mall Publika, is a cosy and friendly place that shares the space with a print shop. The guy who runs the shop is a very friendly Chinese, anything but helpful in terms of cider. Don’t bother asking him about cider recommendations as his focus is only craft beer. Anyway, I liked the atmosphere there as I was treated like a regular customer, not a Masaleh. Anyway, I’ve noticed that most people visiting this shop consider Ales & Lagers as a place to have one or two beers before heading to a nightclub. Ales & Lagers stocks a small selection of ciders from the New Zeland-based Zeffer Cider Company and Australian-based the Hills Cider Company. I tried some of them and will publish the reviews soon. Taps Beer Bar has a few locations around KL. This a good place for the Friday night hangout or to meet other expats. In addition, the food is supposed to be good as per feedback from my work colleagues who usually go there for lunch. At Taps, they usually have at least one cider on draught made by an Australian brewery 2 Brothers. You can check Taps’ current tap list here. Not exactly based in KL, but in Petaling Jaya, which is usually referred as PJ and is a satellite city of KL. The Great Beer Bar is owned by the same person as previously mentioned Ales & Lagers so it is also a craft beer store offering beer in bottles and on tap. But, in contrast to Ales & Lagers they have their own kitchen. Cider wise they have bottled Zeffer and the Hills Cider Company. If there are more cider spots in Kuala Lumpur worth mentioning, just drop me a line! I would be happy to update my post. After my business trip was over, I extended my stay in Boston to visit Downeast Cider House located in East Boston. My extra day was Tuesday, exactly the day when their taproom is closed. So I sent an email to the Downeast Cider team and explained the situation. Luckily, Max replied that he would be happy to meet me at the taproom and sample a few ciders with me. As for some background information, the first time I came to Boston two years ago, cider from the Downeast Cider House was the first Boston cider I have ever tried. And, frankly speaking, I instantly fell in love with. Furthermore, I was so fascinated with their cider that I even considered applying for the position of cider maker, which was open at the time. Downeast Cider House was established in 2011 by two college students Ross and Tyler who instead of taking the exams and graduating, prefered to make hard cider. Over the years the company has grown and expanded and the production site had to move from the first location in Back Bay to East Boston. As for the visit, Max let me try their regular ciders and special releases. Afterwards, Max gave me a tour of their premises and explained all production steps. For their cider, the Downeast Cider team uses culinary and table apples such as McIntosh, Red Delicious, Cortland or Gala, which come from Massachusetts and surrounding states. The juice is pressed at the orchards and delivered to the facility in East Boston where it is fermented with a pale ale yeast. Once the sugar concentration drops to the desired level, cider is pasteurised at high temperature for 30 seconds. Subsequently, cider is either canned or eventually matured in barrels (special releases). Their current canning line is capable of producing 90 cans per minute so during a 10-hour shift they can get lots of cider into cans! Also, Downeast Cider wants to upgrade their canning line with the beginning of the new year to a more effective canning line capable of producing 200 cans per minute. In their taproom, I’ve tried their Original Blend (their flagship cider), which is the first cider they ever released, Double Blend, Drier Side, Aloha Friday (with pineapple juice), Drier Side Hopped Grapefruit, Celebracion (special release blended with lime and aged in tequila barrels), and Hard Arnold (special release blended with Earl Grey tea). I don’t have any detailed tasting notes for you as most of the time I was speaking to Max and asking all the details related to their cider production. But, you could tell that the Original Blend is used as the base for all of the ciders from their range. All ciders were unfiltered, with a similar level of sweetness, except for Drier Side, as well as the tartness. They were all dangerously easily drinkable and very tasty, which doesn’t necessarily mean that they were very complex or full-bodied. But they tasted good anyway. Only, I was the least fond of the Drier Side, which was very watery and thin. But as for my favourite, I couldn’t really decide between Double Blend, Drier Side Hopped Grapefruit, Celebracion and Hard Arnold. In the end, I thought that the Double Blend was my personal favourite. I wish to thank Max from the Downeast Cider House for letting me try their ciders in the tap room, explaining all production steps and showing me around. Also, for being patient and answering my countless questions. Should I ever return to Boston, I’ll try to visit the taproom during opening hours. For more information about the cider scene in Boston and tasting notes of the Original Blend and X Cunard No 44 from Downeast Cider, read my latest blog post. 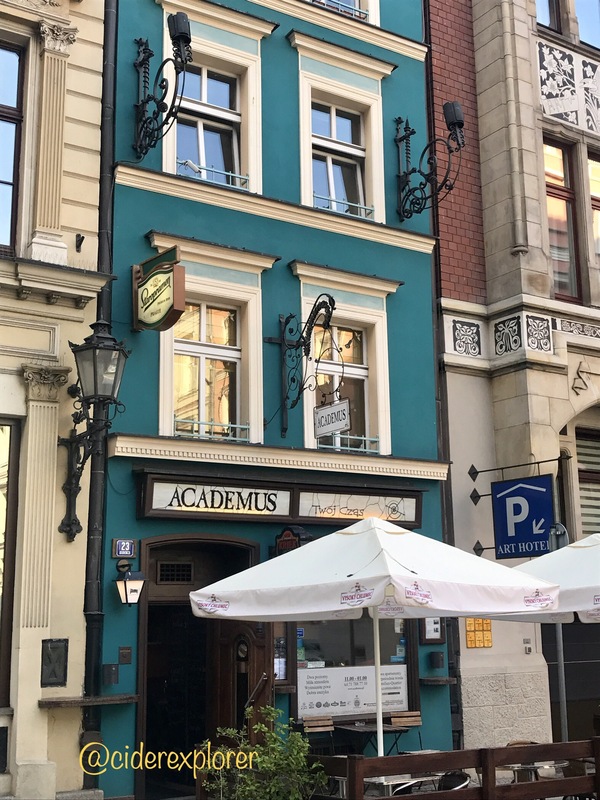 Where to drink/buy cider in Wrocław? Initially, I thought that Academus is a student haven due to its name. However, everyone who likes international beer and Polish cider come here. This small pub and B&B in one is run by a friendly couple, who really pay attention to their guests’ needs. It’s located in the city centre, just a few steps from the main square. From time to time they have Cydr Tradycyjny z Trzebnicy on draught, which is a local cider from Trzebnica located 30km from Wrocław. You can click here to find if and which cider is currently available on draught. Also, you can choose from their selection of bottled Polish craft cider. Vaffa Napoli is located in the historical Jewish Quarter and is actually a restaurant serving pizza and other Italian foods. Apart from really delicious pizza, they have craft cider from Cydr Smykan available in bottles and sometimes on draught. To check their current offer on tap click here. Just a note, they serve cider at too low temperature and with ice. Allow your cider to warm up a little otherwise, you will not taste anything. Also, ask the waiter to skip the ice. Not far away from Vaffa Napoli, you can visit also Marynka, Piwo i Aperitivo, a craft beer bar. I come here mainly for the delicious cider, which you can find in the fridge, Japko from Winnica De Sas but also because you can sit outside in the summer and enjoy the nice weather. Interestingly, they have a book with requests for draught beer, etc. so don’t forget to leave a note ‘CYDR’ (Polish for cider) there. Another advantage is that they have a food truck on their premises, Happy Little Truck serving absolutely delicious, and probably the best pizza in Wrocław. Try their pizza ‘Capperi’, which pairs excellently with Japko. 4 Hops is another centrally located craft beer bar with austere interior design, with no fuzz and friendly staff that knows good beer. Unfortunately, no any sort of outdoor seating is available. More to that, they rarely have cider on tap. 4 Hops stocks Jabko from Winnica De Sas. You can check if they currently have any cider on draught by clicking this link. The staff keep their offer up to date. Another spot for cider lovers, in the summer at Szynkarnia you may find at least one cider on draught from one of the Polish craft cider makers such as Cydr Chyliczki or Cydr Smykan. You can check their current offer here. In addition, bottled cider is available here. To be honest, I never come here as Szynkarnia is always crowded and full of loud speaking people. Also, they seem not to have a good ventilation system as the strong smell of food is rather disturbing. So cider is the only reason to visit Szynkarnia, if you dare. Pasibus is a burger chain so if you want to drink sweet and dull cider of unknown origin, PasiCydr (you can find the review here) with your burger you may taste it at one of their restaurants across Wroclaw. 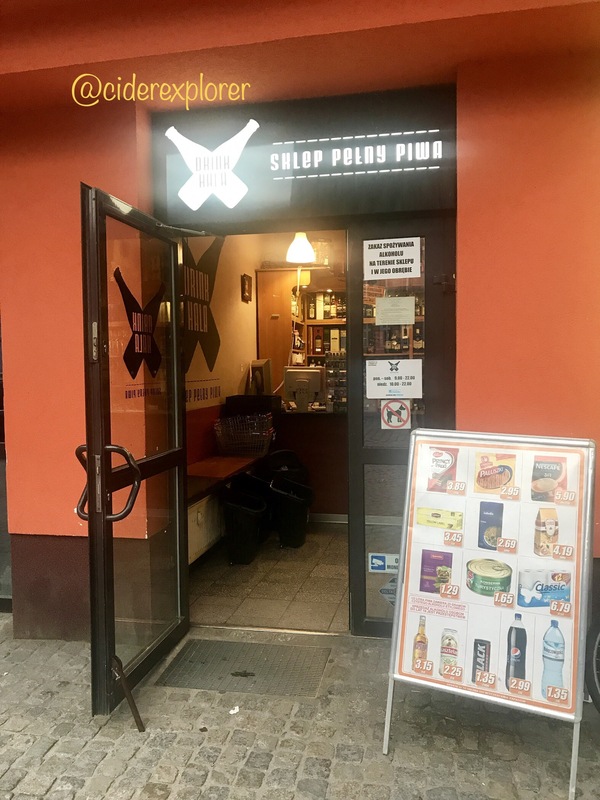 Located in a neighbourhood called Nadodrze, which with every day gets more popular among locals Drink Hala is basically a craft beer shop with a really huge selection of Polish craft cider. But you will find here a range of commercial cider from Poland and the UK such as Westons, as well. I usually come here, when I want to buy a bottle of a recently launched cider as they simply would have every Polish cider here sooner or later. I haven’t seen such an extensive selection even in Warsaw. Another craft beer shop stocking also Polish craft from Cydr Smykan and Kwaśne Jabłko along with Polish commercial cider brands. Dobre Moce is a wholesaler and retailer in one. Since they are based quite far from the city centre I never made it to pay them a visit. However, I know that they stock cider from Manufaktura Cydru. 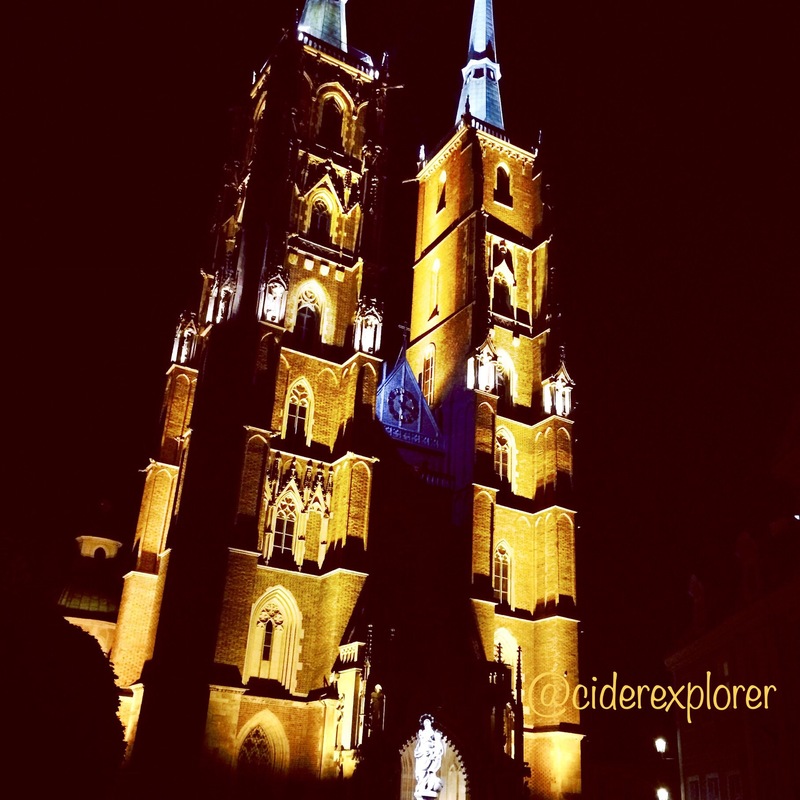 If there are more cider spots in Wrocław worth mentioning, just drop me a line! I would be happy to update my post. Recently, I have visited my favourite market hall/food court in Berlin, The Markthalle Neun. The Markthalle Neun is enormously popular among locals, fresh Berliners and visitors from around the globe craving for high-quality tasty and unique food and drinks at quite reasonable prices. Actually, I don’t remember when was the last time I was there, it must have been around a year ago, so I’ve decided to check if any of the shops/stalls started offering any new cider or perhaps a cider I haven’t sampled yet. During my last visit to the Markthalle Neun I’ve come across a French cidre from Kerné (to read the review click here) at Monsieur Collard, Cidre Fournier Artisanal Brut at Weinhandlung Suff, Lulu de Mere Cidre, which sounds French, but I think it comes from Germany (I’m not sure about it though) at Comptoir du Cidre, and a Spanish mainstream sidra Manzanova. Monsieur Collard still has Kerné on offer, Weinhandlung Suff carries Cidre Fournier, Comptoir du Cidre only occasionally participate in the Street Food Thursday serving a delicious cidre steak (at least they used to) and a Spanish shop offering Manzanova seems to be no longer in business. Luckily, two new cider spots have opened in the Markthalle Neun. The first one is Schaufenster Uckermark selling a range of delicious Apfelwein from Kelterei Gutshof Kraatz, which is based in Uckermark (read my past reviews on their Wilde Kerle and Apfelglühwein). Unfortunately, the shop was closed at the time of my visit but I saw a few bottles of various Gutshof Kraatz’s Apfelweins through the window. Judging by the half-empty bottles of Gutshof Kraatz’ Apfelwein in the fridge they sell also Apfelwein by glasses. I’ll grab a glass of the delicious Wilde Kerle next time I’m around. What a pleasant surprise it was, when I discovered Rødder, a Danish stall offering Smørrebrød, and wild danish cider from two cider makers, Æblerov and Olsens Frugt. Since I haven’t had any Danish cider in my life I just couldn’t wait to give them a try! A 750ml bottle is sold at approx. 20 EUR, but fortunately you can also purchase a wine glass at 4.50-5 EUR. A good option for those who want to try every cider from their cider selection. In addition, at Rødder they always have one Danish cider on draught from Æblerov. In terms of food, I haven’t tried anything as all herring was already sold out, but I heard oohing and aahing of folks, who have decided to order other snacks. Hopefully, I’ll get the herring next time. Back to cider, I have sampled three ciders out of the range presented on the right, Cider from Olsens, and Prendila Cosi the Cox + Cider from Æblerov. Also, I’ve purchased a bottle of the Benene På Nakken to try at home. Scroll down for my tasting notes. In summary, it was my first acquaintance with Danish cider and I’m not disappointed. All sampled ciders from two Danish cider producers tasted nice, were balanced, yet tasted quite similar, wild with notes of nail polish, high dryness and high acidity. My favourite was definitely the last one, the Cox+Cider Aebler 2016 from Æblerov as it was the most complex of those I’ve tried and because it reminded me of Spanish sidra with high acidity, along with acetic and citrus notes. For sure, it wasn’t, my last visit at Rødder in the Markthalle Neun in Berlin. Also, I still have to try the Alkmene from Æblerov, and as announced earlier, Rødder’s herring. Where to drink/buy cider in Toronto? Toronto is a remarkable city with many faces and great, friendly, open-minded people. It reminded me Berlin a bit, not only because of the TV tower. Cider is available here at literally every bar, pub or restaurant. To my surprise, most bars carry commercial cider from Europe such as Somersby. 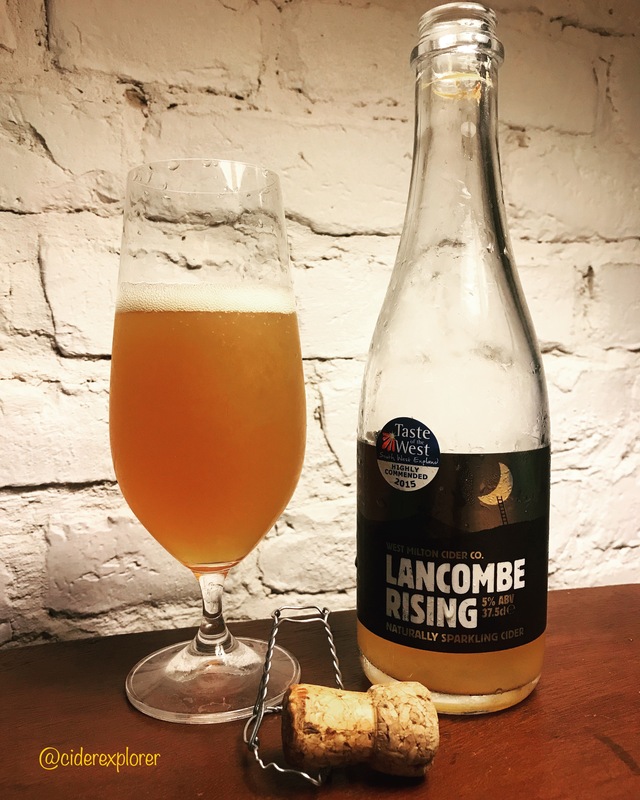 Fortunately, they usually also stock an alternative to this European cider from concentrate, a cider from a local cider maker Thornbury Village. I’ve decided to check what others already wrote about cider in Toronto, and I have found at least two very good articles about where to find cider there. One from Toronto Life published Feb 2017 and one slightly older from BlogTo. Nevertheless, I’ve made the decision to compile my own list and share with you my feedback and impressions. It took me a longer while to write about all the cider spots in Toronto. But here it is! number one favourite in terms of cider spots in Toronto. If I had lived in Toronto I would surely become a regular customer. You can find regularly rotating tap selection featuring local cider makers from Ontario area. Cider flights are also available. If that’s not enough, they have an incredible selection of bottled cider available as well. Since I sat at the bar I kept staring at 4 giant refrigerators stocked with cider from different regions of Canada, mainly Ontario and Quebec, but also the U.S.. Also European ciders from the UK, France, Spain and even Estonia from Jaanihanso can be found here. When I was reviewing the extensive bottled cider menu I was really confused and overwhelmed by the choice here. Fortunately, the staff was amazing and I got a few recommendations for a number of interesting Canadian ciders. Trust me, I wanted to try every single cider on the menu and it was almost a torture to pick only a few. Here is the link to their hypnotizing cider menu. If you’re into ice cider you can sample ice cider from Quebec by the glass. Also, their cocktails are based on cider if you are a fan. Even the food there tastes incredible. Pure heaven! I actually wanted to pay them a visit again on Monday but unfortunately they’re closed on Mondays so you can imagine my huge disappointment. Anyway, Her Father’s Cider Bar & Kitchen is a must visit spot for every cider lover. 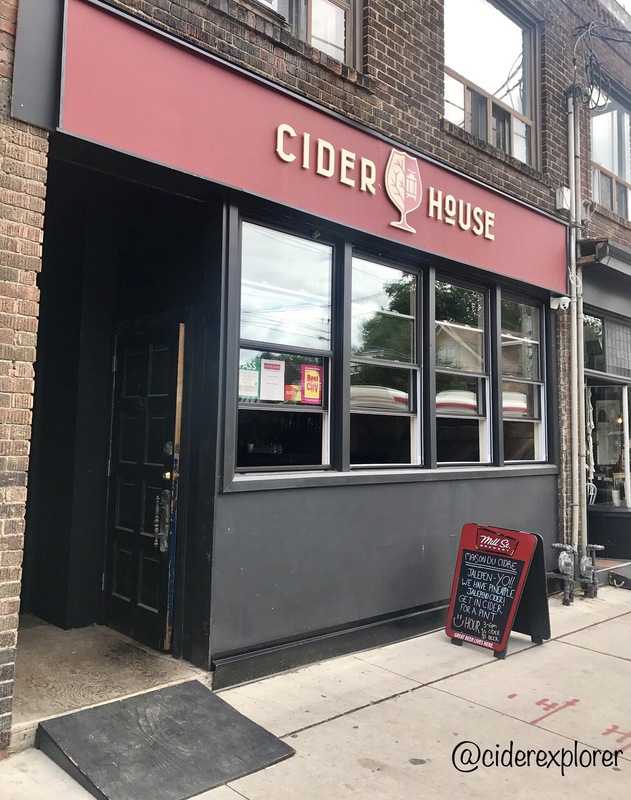 Located in the middle of the Polish neighbourhood on Roncesvalles, the Cider House is a nice and cosy bar that has a wide selection of regional cider from Ontario on tap. Cider flights featuring 4 different ciders are available here at 9 CAD and are slightly cheaper than at Her Father’s Cider Bar & Kitchen. My tasting notes from the visit there can be found here. They also serve food but I wasn’t hungry at the time. Fortunately, Cider House is open on Mondays so I came here one more time before heading to the airport as it was close to Bloor, an UP Express station. Birreria Volo, as the name already indicates, is located in Little Italy. It’s actually well-hidden and it took me a while to find the place. It’s pretty dark with minimalist and modern design that appealed to me. I enjoyed the atmosphere and the dim light in the place. As for cider, at Birreria Volo they usually have 2 to 4 changing regional ciders available on draught. Click here to see what is currently available on tap. Again, they even have Estonian cider from Jaanihanso by the glass. I came here a few times as it was close to my airbnb accommodation and I just enjoyed being there. Tequila Bookworm is a lively bar based in the popular shopping street in Toronto, Queen Street West. Again, it was similarly hidden just like it was in the Birreria Volo’s case. At Tequila Bookworm they have always at least two ciders available on tap. Since they had really weird cider (at least to me) on offer at the time of my visit, such as Vanilla Ice Cream Apple Pie Milkshake cider from Revel Cider Company or Hopped Peach Cider (I’m not a fan of hopped cider) from the West Avenue Cider Company, I’ve decided not to stay there longer and continued my search for cider spots in Toronto. But if you’re not a cider purist like me, you might enjoy your glass of cider here. Since I’ve decided to explore Toronto on foot, which turned out to be a terrible idea as I wasn’t aware that streets can be that long here, I didn’t manage to check The Only Cafe. But I hear that they also have a great cider selection. 5 changing regional craft ciders on tap. For their current line-up check here. Wvrst is another place famous for craft cider, and sausages, I would guess (Wurst is German for sausage) that I didn’t manage to check out as it was on the other side of the city and thus not part of my route. However, from what I read now about this place, I do regret that I didn’t pay them a visit. Next time! In terms of shops, you will find cider at special stores that have a licence to sell alcohol called LCBO. I was told that ice cider is available only in the winter here. They have many stores around the city and the state. You can also purchase cider straight from the source if you decide to visit a tasting room of one of the local cider makers. Check out the website of the Ontario Craft Cider Association to see the list of local cideries. Cheers! If there are more cider spots in Toronto worth mentioning, just drop me a line! I would be happy to update my post. Apples: a blend including Dabinett, Yarlington Mill and Chisel Jersey. Appearance: pours a hazy pale amber with a massive head, which only slowly dissipates. Highly carbonated, with beautiful strings of bubbles. Body is medium. Sediment in the bottle. Aroma/Nose: the nose has apricots, raisins, overripe and fermented apples with wood. A beautiful scent typical for French cidre that makes your mouth water. Taste: it starts slightly sweet with low acidity and a hint of vinegar. Followed by dried fruits such as apricots, raisins and fermented apples. I can also get a bit watery taste with a smoky note, a lingering taste of wood with a medium to high astringency, a hint of lemon and a distant barnyard note. Availability: in the UK from Cider Supermarket. In other European countries e.g. from Cider Lab. Price: purchased online from Cider Lab at 6.50 EUR.